Kahn is a litter brother of Brooke and Maverick. Kahn is shown and loved by Jenni Williams, who lives in Western Australia. Kahn has taken out 3 Baby in Groups and is now in Minor Class. Jenni I wish you all the best in the future with Kahn, and I know you will do us proud at Placky Shih Tzu's. Kahn gets Challenge dog at Western Australia Royal. Kahn gets Runner-up Best In Group at nine months of age. 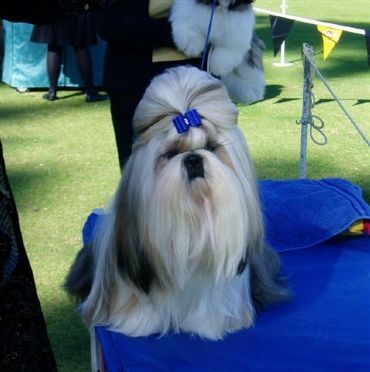 Congratulations to Jenni and Kahn who achieved to classess in show on the one weekend. Congratulations to Kahn and Jenni. 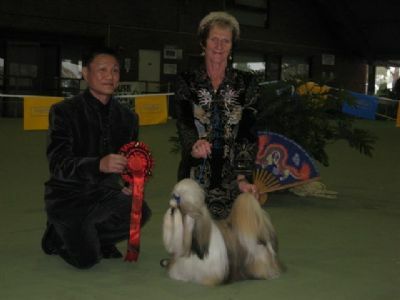 Kahn wins BEST IN SHOW AT THE ORIENTAL BREEDS SOCIETY OF WESTERN AUSTRALIA, UNDER SINGAPORE JUDGE MR N CHIN.